Grace Fulton, age 15, began her training at Westside Ballet under the legendary Yvonne Mounsey, one of George Balanchine’s first principle dancers. Curiosity and interest in Russian training lead her to Dmitri Kulev Classical Ballet Academy. Within her first year with Dmitri and Jennifer she placed third in woman’s classical at YAGP Los Angeles and in New York City, became a 2010 YAGP Finalist. 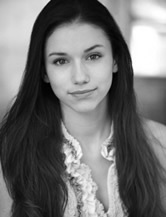 In 2011 she returned to YAGP dancing with her current partner Patrick Frenette. She regionaly placed first as a soloist classical dancer, third place contemporary, choraphaphed personnally for Grace by Victor Kabiniev, and first in pas de duex – Le Sylphides. Grace continued on to the YAGP New York Finals dancing her classical, contemporary, and pas de duex pieces. She finished as a top twelve woman finalist at the New York Fianals. Along with dancing Grace has enjoyed success acting in film and television. She played young Natalie in The Natalie Wood Story, appeared as a guest star on Jag, Bones, Ghost Whisperer, and recently in Hallmark’s Our First Christmas. Currently devoting all of her time to ballet she is thankful to be training under the direction of Dmitri and Jennifer Kulev.